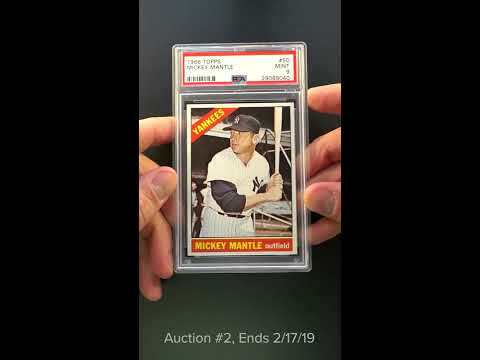 It's been quite a long time since we've offered a 1966 Topps Mickey Mantle PSA 9 that has truly impressed us. A whisker from our PQ designation and rates a '2' on our eye appeal scale. What we have here is a specimen which holds many attributes of a GEM MINT card. We love this card for many reasons; most of which are quickly conveyed by the scan. A completely fresh example with four untouched corners, blemish free edges and virtually flawless surfaces. Entirely void of excess print with stunning gloss and clarity present. Perhaps the faintest of centering shifts top to bottom is all that prevents the PSA 10 designation. All told, this is a truly spectacular example of one of Mantle's most beautiful cards. A steal at anything in the realm of a PSA 9 price tag. One of over 15,000 cards, lots, and sets up for bid in our 2nd Auction of 2019. Click on the link above to view the other PWCC auction lots. The PWCC Vault is now live! Open a PWCC Vault account and receive a custom Vault shipping address. Purchases shipped to the Vault receive free shipping and reflect Oregon's 0% sales tax rate.